We love Katrina Kaif’s muted Tarun Tahiliani sari that she pulled off beautifully with minimal makeup and jewellery. Sari is always a great option for Diwali simply because we don’t get to wear saris often, so it’s like a breath of fresh air when it comes to styling! Saris look great on every body type and muted tones suit all skin colours as well! It’s definitely a big YES from us for this look! Taapsee Pannu chose to opt for the classic red and black combination for the Bachchan’s Diwali party last year. This is a stunning lehenga by Priyal Prakash and we’re loving the dupatta drape too. Also, the maang tika works stunningly well with the outfit! Suhana Khan’s royal blue lehenga looks so gorgeous we can’t stop staring at it. The velvet choli and the fall of the lehenga along with the latkans on the dupatta add to the overall finishing of the outfit! A 10/10 party outfit for Diwali! Shraddha Kapoor looks like a dream in this emerald green and gold lehenga. Textured wavy hair and and a bright red lip seem to be doing complete justice to the look. This Diwali party outfit is a perfect mix of traditional and glam. Kareena sure knows how to ace it in bronze, a colour women usually fret to wear but actually looks stunning on almost everyone. Complementing the look are the stunning chaand baalis and the big round bindi! A Diwali party dress you should definitely get inspired by. Sarah Jane Dias kept it rather simple yet chic in a powder blue saree paired with a metallic clutch. Understated makeup and easy breezy hair are our favourite part of her look. With this look, she proves that festive occasions are not always about the golds, reds and the sequins. You can keep it simple and yet slay it! A definite game changer when it comes to party wear. Jacqueline Fernandez has her sari game on point with some serious colour blocking. We love how she has experimented with a traditional blouse style and layered the gold necklace on top! Not that’s a Diwali party outfit to love. Sonakshi Sinha wearing this Arpita Mehta lehenga translates into all kinds of gorgeous. The halter choli caught our attention instantly and we absolutely love her bronzed makeup look. The cherry on the cake was that she sported a gajra in her hair! 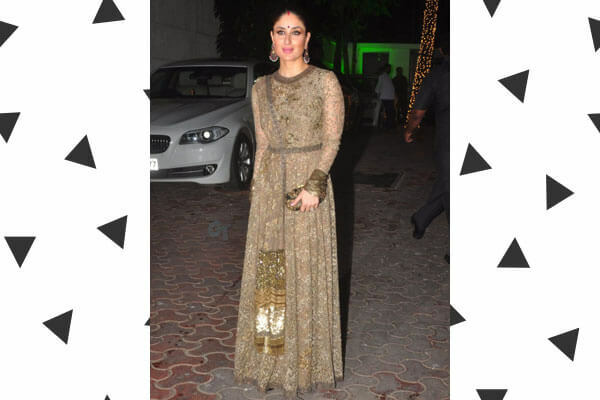 She redefined Diwali party wear and how! And that’s it from our favourite Bollywood party outfit inspirations! How many of these do you love?